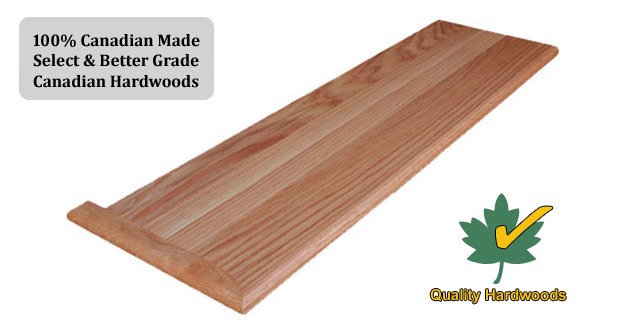 Buy Solid Hardwood Standard Stair Treads Direct Online At Discount Prices - We Ship Canada Wide. Hardwood Types: Oak, Maple, Birch, Cherry, Jatoba, Etc. - Standard & Custom Full Standard Stair Treads. - Total Width = 10-1/2"
Custom Sizing Note: We can make our standard treads to almost any size you may need ( so, if you find that your need a 11-1/2" or 16" width or you need treads 96" long, this is no problem for us ). We can pre-finish your hardwood Standard stair treads and risers order in our professional spray booth finish shop, so your treads are ready to install the day you receive them. From a natural clear coat, to a custom stain match to your flooring, or 1 of 25 MinWax colors, when it comes to prefinished stair treads we cover all the bases.